We all have stories about what Mountain Challenge means to us. Each story tells a unique, personal experience, yet they all share a common thread . . . change. People have been changed. Lives have been changed. One person at a time. Once you’re in, you’re ALL IN. Alumni of Mountain Challenge started wondering if we could do more . . . What if we could truly be ALL IN – in ways that would help foster the same kind of changes we experienced as staff members? We came up with an idea . . . an idea that seemed outrageous at first. An idea that would challenge us to feed the rat in ways we hadn’t considered before. To be the first college program that is completely self-sustaining. This means that no Maryville College tuition dollars will go to fund Mountain Challenge – all money to operate the program will come from the business side of Mountain Challenge or alumni. That’s a lofty goal, we know. But we climb mountains. We paddle class 4 rapids. We sleep outside in tents in freezing temperatures. We ride our bicycles over 100 miles in one day. Reaching lofty goals is what we do. The Mountain Challenge Alumni Association was established in 2016 in order to achieve this goal. The enhancement, operation and continuation of student experiences. Experiences that change people and change lives. Learn more about what the Alumni Association has been up to since it’s inception. How can you be ALL IN? 180° from the norm. By giving just 50 cents a day, you can help Mountain Challenge continue to change the world for the better, one person at a time. Donate another amount at your comfort level. Forward this email/information to anyone you know who might be interested in helping. Donate online at the Maryville College Website. 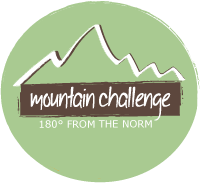 Be sure to select “Other” from the designation drop-down and then enter “Mountain Challenge” in the notes section. Mail a check made payable to “Maryville College” with a note/memo designating the funds for Mountain Challenge.